The Retreat has been furnished and planned to provide a superior vacation home for families, reunions or people planning to marry in the Sunshine State - just pack your clothes and go! From the 40ft 20ft pool with its extended deck, spa and separate character shaped paddling pool, to high quality furnishing, home entertainment systems and games room-there is something for everyone. The Retreat has Four King Bedrooms, One bedroom with 2 Queen size beds, One bedroom with 2 Full (Double) size beds and 1 bedroom with 4 Twin sized beds (2 sets of bunk beds) - sleeping 18-20 altogether. We have avoided 'theming' the villa so that kids of all ages can enjoy. The DVD library has kids and grown-up films. There are toys and board games for the kids, a PS4 and Xbox with games and an air hockey table in the games room. It was a nice house it had everything we needed for the days we stayed. Our kids enjoyed the pool and games the most. We would definitely stayed there again..
Really enjoyed our stay at The Retreat Villa. The home was beautiful and very clean. The pool was massive and well heated upon request. Pauline was very responsive to our needs. I would definitely stay again. Gorgeous and huge home. Well appointed with plenty of room. Comfortable beds and big TVs everywhere! Pool and spa were great. Only a very short drive to Disney and local shopping. Very nice owner provided excellent pre arrival directions and instructions. We also enjoyed the clean and clear up front pricing model where there were no surprises during the reservation process. Highly recommend. Enjoy your trip! Owner was so attentive and accommodating!! House and amenities in the home and surrounding area were a Dream! Will definitely recommend to anyone looking!! The house is beautiful with plenty of room to stretch out. There was limited toilet paper, but the Wal-Mart is a quick trip down the road. We had a great stay. Superbly located. 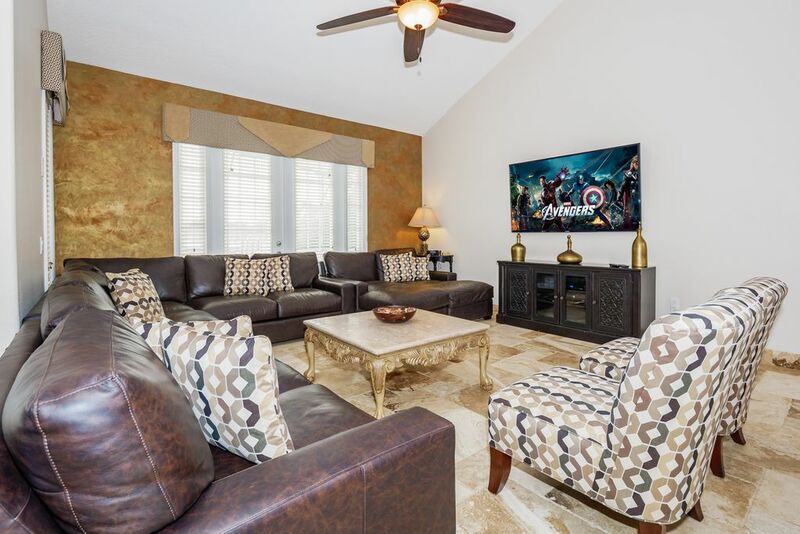 Less than two miles to Disney World.. Close to Animal Kingdom Pleasant walk or short drive to shops, many good restaurants, medical centre, bank, 24 hr pharmacy, 18 hr supermarket, themed mini golf. Close by restaurants include Red Lobster, TGI Fridays, Outback Steakhouse, Carrabas Italian, Cracker Barrell, Giordiannos Pizza, Pizza Hut, Shoneys and many many more. 5 mins to Disney World. 20 mins to Islands of Adventure and Universal Studios 15 mins to SeaWorld, Discovery Cove (swimming with Dolphins) and SeaWorlds new aqua park Aquatica. 50 mins to Busch Gardens. 15 mins to Universal Drive 15 mins to Outlet Malls and Shopping Malls Easy reach of airports 50 mins to East Coast beaches, 60 mins to West Coast Numerous golf courses nearby. Activities nearby. Helicopter rides Hot Air Balloons Airboat Rides Golf Course - Mulberry Park is close to Orange Lake, Celebration/Mystic River, Champions Gate, Disney, Highlands Res, Falcons Fire/Crest. Inclusive of taxes and final clean. Please add $250 per week for gas pool heat. Solar pool heat is free.